I have created a page for PIG on Facebook that you can find here. I tend to update it more often than this blog, reflecting the pernicious way that Facebook has managed to become a central hub of our on-line existence. I know a lot of people who seem to be able to constantly update blogs, Tumblrs, Twitter feeds, etc. but I am clearly not one of them. So, if you are a Facebook user, feel free to find, like, and follow PIG there as well. Thanks. My friend Lisa notified me about this recent PBS Newshour feature (here) on the challenges faced in satisfying China's growing demand for meat. 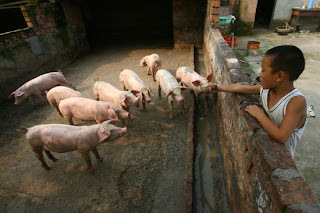 In this eleven-minute documentary, Mary Kay Magistad looks at China's efforts to feed a growing urban population that associates meat eating with prosperity but simultaneously demands inexpensive pork. The resulting pressures on the environment, combined with public concern for the safety of their food, has put meat producers and the government in a tight spot. Highly recommended if you are interested in pigs and pork and development in China. I have contributed a couple of short articles to the Humane Research Council blog (HumaneSpot.org) that concern my ongoing interest in "how distance and concealment operate as mechanisms of power in modern society," as Timothy Pachirat has succinctly put it in the introduction to Every Twelve Seconds: Industrialized Slaughter and the Politics of Sight (Yale, 2011), his important ethnographic study of the modern industrial cattle slaughterhouse. The first of these two posts (here) deals with the visibility of pigs in cities. The second post (here) looks at the changing status of slaughter and the slaughterhouse. I hope you find them both interesting. 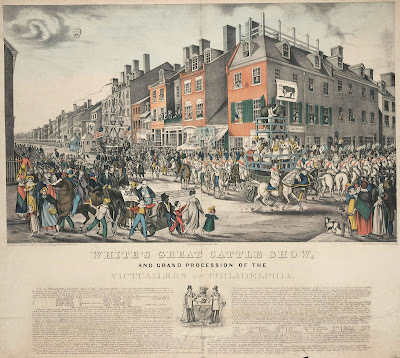 This image is a lithography depicting White's Great Cattle Show and Grand Procession of the Victuallers of Philadelphia, which took place on March 15, 1821. 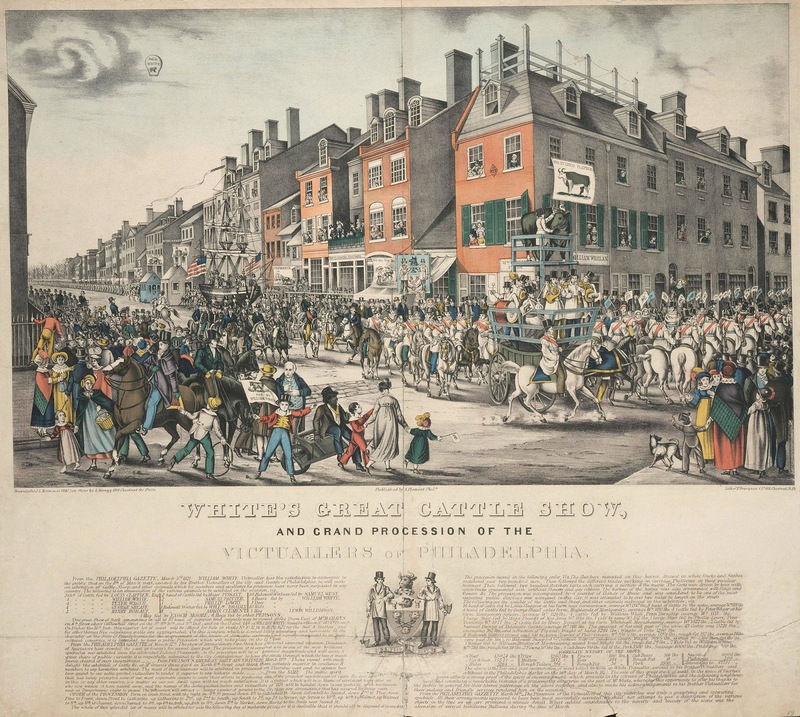 After displaying "improved" cattle, hogs, and sheep during the week prior, more than 86,000 pounds of meat was paraded through the city for a crowd in the tens of thousands. A pretty remarkable example of the visibility of meat production at an earlier moment in American history. 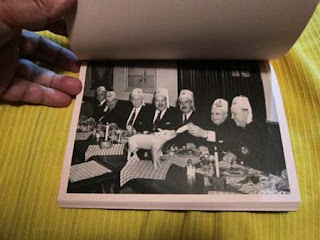 While in Utrecht for the international Minding Animals conference my eye was caught by a pink book with a picture of of pig being bottle fed at a restaurant on the cover. Turned out that this book was volume 10 in a series published by Kesselskramer Publishing (here) called "In Almost Every Picture." This volume contains photos collected by Michel Campeau taken between 1938 and 1973 at Au Lutin Qui Bouffe, a restaurant in Montreal, where feeding a piglet was the restaurant's gimmick. The photos are charming, as is the design of the book by Erik Kessels. 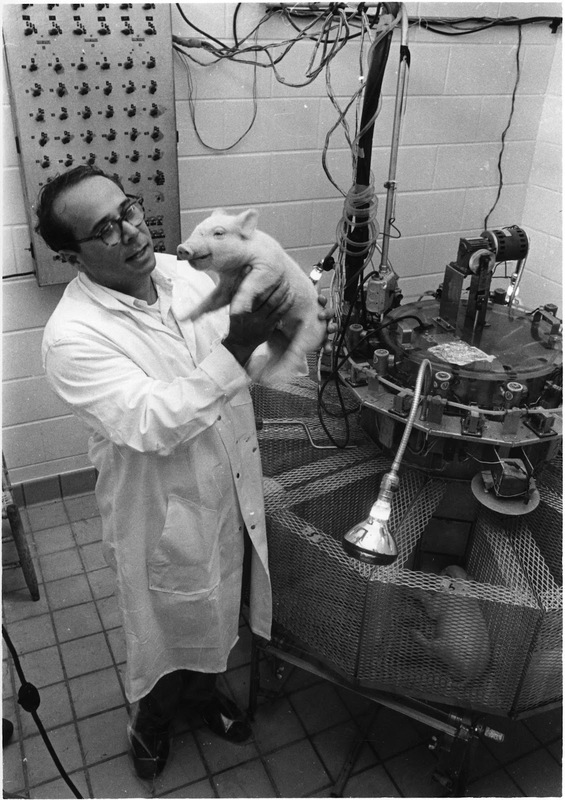 I wish I'd known of these images prior to finishing PIG, as it would have been great to have included one of them. 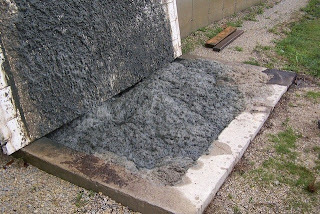 My friend and colleague Sean tipped me off to an article about a mysterious foam that grows in some hog farm manure pits, seen here in this remarkably disgusting photo. This foam traps methane gas, which can then explode. According to Brian Keirn, who wrote the report for Wired.com (here), six farms have exploded since 2009. The effects of the foam, which is a problem on one out of four hog farms in the midwest, are clear, but why some farms develop the foam and others do not is still unclear. One theory traces the foam to the increasing use of distillers' grain in the pigs' diets, although antibiotic use, changes in water use, and genetic modifications to pigs themselves are all on the table as possible contributors. The New York Times ran an article (here) on March 11, 2012 about the wild-living pig problem in New York's Champlain Valley. These pigs now occupy five of the state's sixty-two counties and appear to be thriving in this agricultural region. The article, by Lisa Foderaro, notes the fear that these animals might eventually reach Adirondack Park, where they could do tremendous damage to this wilderness area. 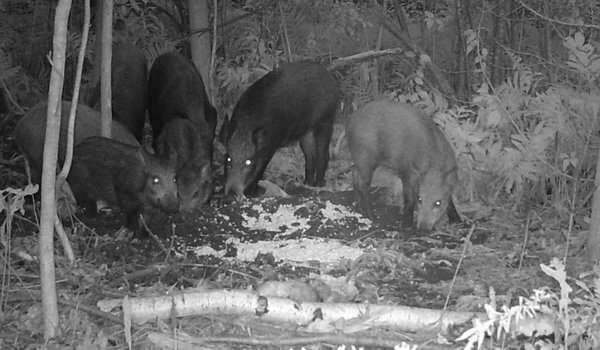 Much of the article concerns the difficulties involved in capturing these pigs, seen in this New York State Department of Environmental Conservation night-vision photo. 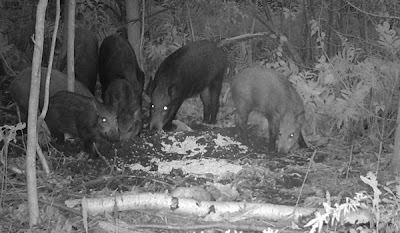 The source of these animals is unknown, but it is likely that these wild-living pigs are a mix of domestic livestock or pet pigs that escaped or were released and Eurasian wild boars brought to the state as a game animal. In Pig I devote my concluding chapter to wild-living pigs, a growing problem throughout the United States, as marking the return of the repressed. Given what I've learned about wild-living pigs, I'm not all that optimistic about the long-term success of efforts to control these animals in rural, agricultural areas of New York.